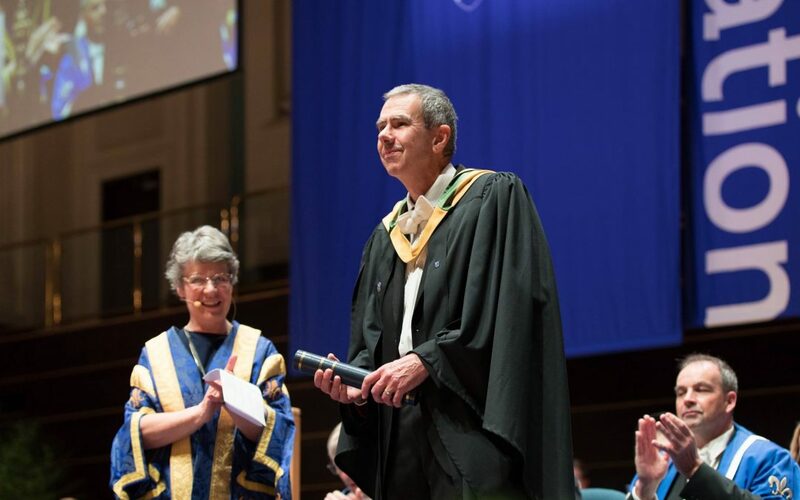 Graduation is often a time for celebrating excellence, but for John Lee, the former Head of Undergraduate Studies within the School of Nursing and Health Sciences, this year’s ceremonies were extra special as he crossed the stage to receive a Chancellors Award for Outstanding Contribution to Teaching in front of his new graduates. John, currently on secondment working for the Scottish Government as a Professional Advisor for Nursing, Midwifery and Allied Health Professionals Education, has excelled in his career but nursing had not always been part of his grand plan. John found his passion for teaching other nurses and helping students to learn. After going back to university part-time, John embarked on his first teaching job in higher education, teaching science, primary care and general nursing. “Nursing is a complex, broad-ranging, challenging profession and it requires a lot of skills. I feel that it’s important for the personality of the lecturer to come through to students, that’s what makes it a personal experience for them. I’m interacting with 400 people in a lecture theatre at a time, there are over 1000 students in our Nursing programme who are all going out in practice and making a difference. I get great satisfaction from seeing our students do well, and watch our staff help them and teach them how to make a difference. More than 1000 undergraduate and postgraduate students received degrees, diplomas and other qualifications at the University’s Winter Graduation ceremonies on Thursday 15 and Friday 16 November.